It finally warmed up above freezing all of last week and almost all the previous snow was melted. Note - the operative word being WAS. It started snowing yesterday at about 2 p.m. and in about 12 hours, we had another 9 or so inches of snow!! 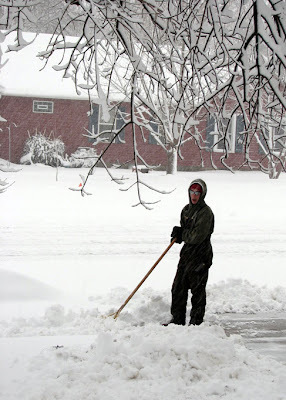 This is one time when I'm pretty happen with our agreement - Justin shovels snow, I mow the grass. I might have to mow a lot more frequently than he has to shovel, but I'd much rather be outside when it's warm than when it's like this! 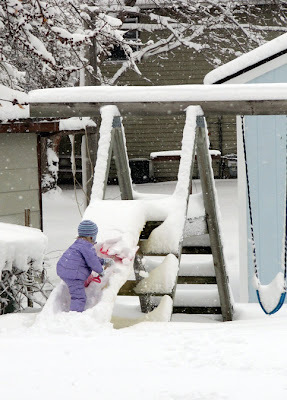 Although Kaitlin does love the snow, I think she is missing being able to play outdoors more...maybe the fact that she's trying to dig out her play set is a clue that she's ready for some warmer weather, too!